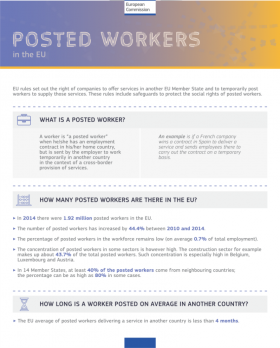 European Commissioner for Employment, Social Affairs and Labour Mobility Marianne Thyssen unveiled a proposal for a revision of EU rules on posted workers on 8 March. 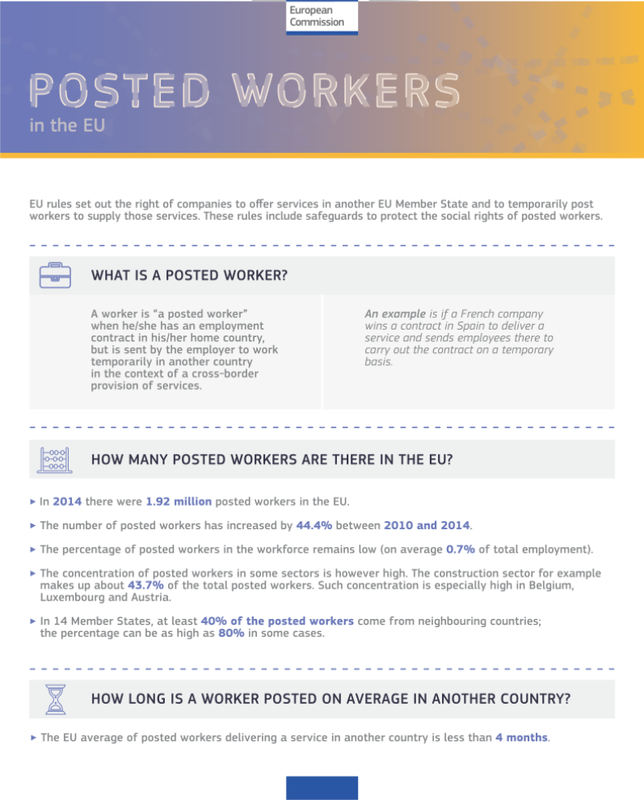 Posted workers are workers who have an employment contract in their home country, but are sent by the employer to work temporarily in another country in the context of a cross-border provision of services. The aim of this proposal is to facilitate the provision of services across borders within a climate of fair competition and respect for the rights of posted workers. More specifically, the initiative aims at ensuring fair wage conditions and a level playing field between posting and local companies in the host country. It will introduce changes in two key areas: remuneration of posted workers and long-term posting. First, the proposal foresees that across all economic sectors, the same rules on remuneration should apply for posted workers as for national workers, as laid down by law or by universally applicable collective agreements. Currently, posted workers are only entitled to the same minimum wage as national workers. Often, though, remuneration not only includes the minimum rate of pay, but also other elements such as bonuses or allowances (e.g. allowance for bad weather; mobility allowance; pay supplement for special works; allowance for tools wear …) or pay increases according to seniority. Second, for all activities undertaken by a posted worker, the worker will become subject to social security payments in the host Member State if the duration of posting exceeds 24 months, unless conditions in the home Member State are more favourable for the posted worker. Finally, the Member States have to implement the Enforcement Directive (2014) into national law by June 2016, which includes key elements for better enforcement and control of the rules on posted workers, such as automatic information exchange between Member States and new control tools for labour inspection services in the fight against social fraud and social dumping. In the next step, the proposal will be discussed in the Council of the EU and in the European Parliament. As with the 2014 Enforcement Directive, EUCDW is committed to a strong involvement in the discussion and decision in Parliament, together with our partners of the EPP Workers’ Group. The aim of this proposal is to facilitate the provision of services across borders within a climate of fair competition and respect for posted workers' rights.